‘There is a lot of mythology about these events…’ (Sir Tom Devine The Times, 3 February 2018) …the deployment of the army to Glasgow in 1919. In November 2017 I needed to distract myself while sitting by my wife’s hospital bed and decided to update my article on the invention of a piece of history and the use of the newly created ‘factoid’ for political ends. (‘The birth and development of a factoid, 2013–17: the invention of history in the Scottish independence debate’) The factoid, that ‘Churchill was going to abandon Scotland if the Nazis invaded’ was a matter of personal interest. It was my book ‘If Hitler comes…’. Preparing for Invasion: Scotland 1940 (Birlinn 2013) that was misrepresented to ‘prove’ it. Searching online for examples inevitably turned up other Churchill ‘facts’. One of the most common was along the lines that he ‘sent the tanks to Glasgow’ in the ‘Battle of George Square’, 31 January 1919. I was struck by the major inconsistencies between different versions of the story of the military deployment in 1919, both in print and online, and wondered if there was room for me to write another paper comparing history and mythology. It quickly became clear that, while there was a lot of myth, there was precious little history. Indeed, some popular accounts repeated ‘facts’ that can easily be shown to be untrue. Academic history of the labour movement in the early 20th-century has also tended to see the ‘Battle of George Square’ as a distraction from the important political and social developments within which it occurred, and has often dealt with the ‘Battle’ summarily. In the absence of an evidence-based account of how 10,000 soldiers and 6 tanks ended up in the second city of Empire, over a long weekend, mythology has flourished. Churchill sent the tanks, a howitzer and 12,000 young, inexperienced English troops against 100,000 peaceful demonstrators in George Square, many of whom were injured or killed, to crush the strike. These elements are deployed over and over again to tell a dramatic story, or to project a narrative of grievance and victimhood, but not a word of this is supported by the contemporary evidence; indeed, most of it is directly contradicted: Churchill didn’t (indeed couldn’t) send them; no howitzer; 10,000 men, mainly Scots, of mature years and bearing wound stripes; no more than 25,000 in the crowd; sent against a riot; the infantry arrived hours after the trouble was over and injured no-one; the tanks arrived 3 days later; the strike continued for 12 days after the army arrived. 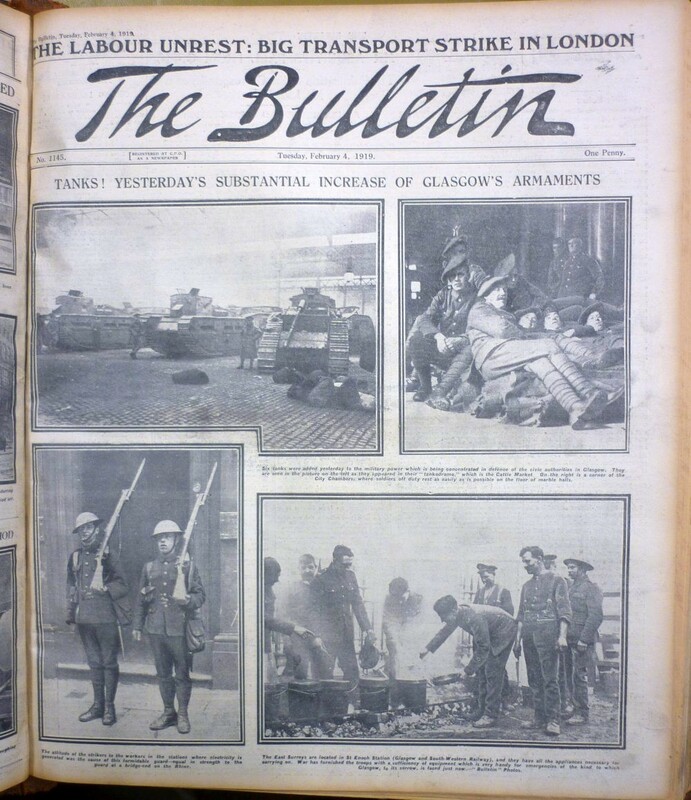 My article in the Journal of Scottish Historical Studies – ‘“Duties in Aid of the Civil Power”: the deployment of the army to Glasgow, 31 January to 17 February 1919’ sets out what the contemporary evidence suggests actually happened. 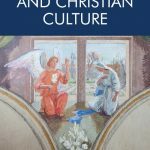 It will appear in the November 2018 issue and I’m glad that the Journal has been able to publish it in time for the centenary. At top left are some of the tanks, which had arrived the day before, in their depot in the Cattle Market. Top right, Scottish soldiers of mature years in Tam o’Shanter bonnets and Glengarry caps, taking their ease in the City Chambers. Bottom left, two soldiers of indeterminate origin standing guard. Bottom right, men of the East Surrey Regiment (one of two English battalions deployed, although this unit was based at Bridge of Allan in Perthshire at the time) cooking their food at St Enoch Station. Gordon Barclay graduated from Edinburgh University in 1976 where he also gained his doctorate in 2001. He worked for Historic Scotland and its predecessors from 1977 until his retiral at the end of 2009 as Head of Policy. Gordon was in charge of the archaeological work in advance of the Holyrood Parliament and has published extensively on 20th-century defence archaeology. 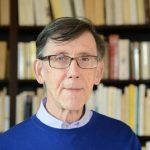 He has written about the impact of English and Scottish national identities on the writing of ‘British’ prehistory and has developed this work into an exploration of mythologised history in political discourse. His next book, ‘The Fortification of the Firth of Forth 1880-1977: “the most powerful naval fortress in the British Empire”‘ (with Ron Morris) will be published by the Society of Antiquaries of Scotland in 2019.